Although this site is primarily for songs in Irish, we also keep a selection of the most popular songs in Scottish Gaelic. 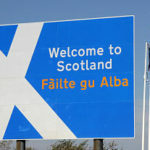 Old Irish was brought to Scotland in the 4th century by settlers from Ireland, which gave rise to modern Scottish Gaelic. Both countries share a very similar song tradition.